Question: Where will you be at 6.30pm on Tuesday the 4th of December? 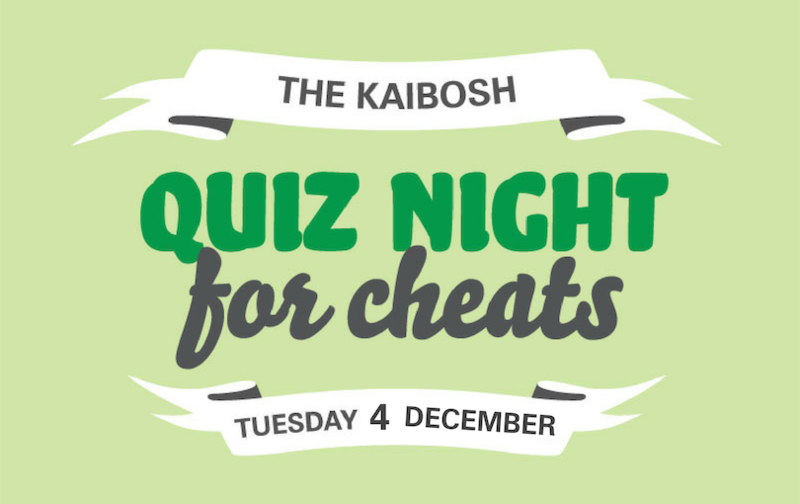 The 2018 Kaibosh Quiz Night for Cheats is back – bigger, bolder and brighter than ever. Tables will be selling fast, so book your table now! This year’s quiz kicks off at 6.30pm, Tuesday the 4th of December at San Fran (171 Cuba Street, Wellington). At Kaibosh’s Quiz Night for Cheats you don’t need to know the answers – you can cheat your way to victory by buying answers to the questions you don’t know! It’s all for a good cause – for every $20 you spend, Kaibosh can provide 20 meals to those in our community who need it most. Plus you get to have a fun night out and win cool stuff. We’ve got some awesome prizes up for grabs, and the winning team takes all – so come along, cheat to your heart’s content, and feel good knowing you are helping Kaibosh to feed the less fortunate in our community. Email to book your table now!